It’s a cold October night. The wind gusts, the rain pelts against the window — there’s no good reason to leave the house. Fortunately, I don’t have to. I hunker down on my couch with a glass of Scotch, and fire up Google Hangouts. It’s time for another meeting of the Finer Things Club. The Finer Things Club is the brainchild of my friend James, who, wanting to keep in touch with friends living in disparate parts of the country, pitched the idea of a virtual Scotch-tasting club. Unlike the club of the same name on The Office, there are no costumes (yet) or required reading, though a bit of research doesn’t hurt (my knowledge of Scotland’s geography is steadily improving). I’ve been a Scotch lover since college. My parents are Scotch drinkers, and growing up I always associated the sprit with grownup sophistication. It took me some time to acquire a taste for it, but once I did, I never looked back. James’ interest in Scotch was piqued during his time in Portland, Oregon, where he discovered the Multnomah Whiskey Library, an exclusive bar with an extensive selection of whiskey from round the world. I had the opportunity to visit the Library earlier this year; it’s easy to see how this place could make you fall in love with scotch. Our club works like this: one of us selects a bottle of Scotch, the rest of us track it down at a local retailer, and we convene on a Google Hangout every couple weeks to sample it together. We’ve kept our price point in the medium range, maxing out at around $100 — drinking Scotch can be a pricey hobby — so no bottles of Macallan 18 or Johnnie Blue just yet. This idea might sound like a high-tech workaround to drinking alone, but we are all about enrichment, I assure you. Our sessions are not overly structured, but they do have some focus thanks to our friend Luke, who uses a tasting wheel to guide us as we train our palates to identify citrus, peat, smoke, malt, and other characteristics. None of us are super tasters or experts here, so there is no judgment and no wrong answers. None of this is very scientific, but after a couple sessions, I feel like I’m learning something. For example, I’ve learned that drinking Scotch after 10 p.m. on a Thursday makes for a difficult Friday morning. 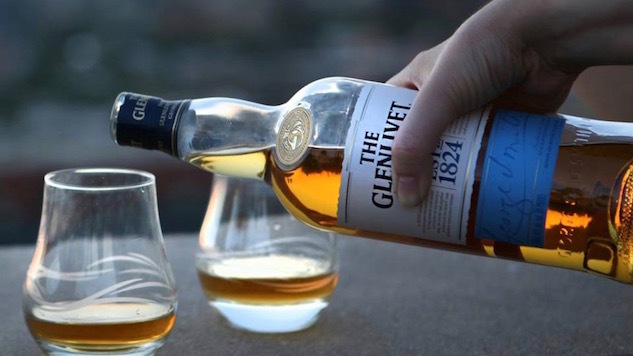 Our inaugural outing featured The Glenlivet 15 French Oak Reserve, an oaky, accessible single malt with just enough spice and fruit to have some depth and character. Consensus was generally favorable. For our second session, I recommended the Clynelish 14, a more complex and floral expression with notes of honey, spice, and some subtle peat. It was also well received. Between sessions, our group chat is a lively ongoing conversation about bottles we want to try and whiskey-related revelry. But the Scotch is a Macguffin. My buddy’s goal was to keep connected with far-flung friends. In that respect, it’s been a success. The bonus is my Scotch collection and my palate has grown by the week.